Start reading Grunch of Giants on your Kindle in under a minute. Buckminster Fuller, obviously, is a very intelligent person. His engineering and creativity throughout his life was amazing. Unfortunately, like Marshall McLuhan he has a need to use very long words when short, simple words would be better. This makes reading the book harder (and much longer). Being an academic I often find this with doctoral students -- they are insecure and think big words will make them appear smarter; It doesn't work. Maybe I just miss Ernest Hemingway! There is a lot of meat in that potato. Anyone who is in business, finance, or stock investing should read this book. You will really gain an understanding not taught in school or learned in experience. To this you know all that is in this book would be a MISTAKE. I have held the highest security licence in the country, but this book taught me new information I wish I'd known 25 years ago. Just buy it if you fit the description above. Otherwise, unless you are a historian it might not be of much interest, and too hard of a read if the subject is not of interst. For those who should read it, it's hard to put down. 5.0 out of 5 starsWow, an inspiring work. 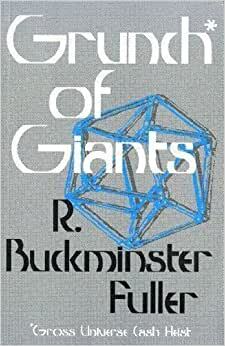 This was a short quick read into the mind and ideals of the late great Buckminster Fuller. This is definitely one of the best books I've ever read. It causes you to think on many levels simultaneously. From the rarley used words he so eloquently chooses to his radical yet evolutionarily sound and hopefully inevitable vision of an earth populated with billions of people living in abundance in tune with mama nature. This is an inspirational read for anybody even remotely interested in science and humanity in general. Buckminster Fuller saw right through the political-money elite schemes of our era and plainly points out easy to implement remedies for solving many of humanity's current problems and some future ones as well. Quite possibly the most important book I've ever read. I'm inspired to make positive change in the universe, hopefully you are too. I think the book is really a comprehensive accounts of human history. it teaches how we got in our present complex situation. the book does not suggest what to do in a complex economy. however, every lines you read mean something between the lines. what i like the most is that you can have some other readings like its company the critical path. you can put down the book and think it through and figure out the fragmented dots or pieces from other readings. you can relate it with today's headlines. the books seems to show some patterns and emergent trends.one thing also for a newcomer of the books of bukcminster-it needs to be read reflectively, because it is too scholarly. when one is used with the jargons, one can actually read it fast.perhaps repeated readings will make one understand it more. it's true...that it is more of a book on conspiracy. how the naive were cheated....many times not just many times but for a lifetime.THE GOOD WITH THIS CONSPIRACY IS THAT IT WAS TOO SUBTLE...THATEVEN THE BRILLIANT ARE UNAWARE OF IT. even the presidents and the congress are pawns in a chessboard! it's realy shows the GROSS UNIVERSE CASH HEIST!that's why it is five star!